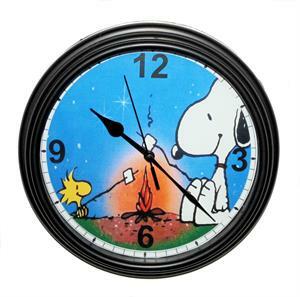 Snoopy & Woodstock Camping Out. Bonding over an open fire and toasting marshmallows. Quartz movement clock using 1 AA battery. Clock is 8.75" diameter and 1.5" depth. Black acrylic case with glass cover.